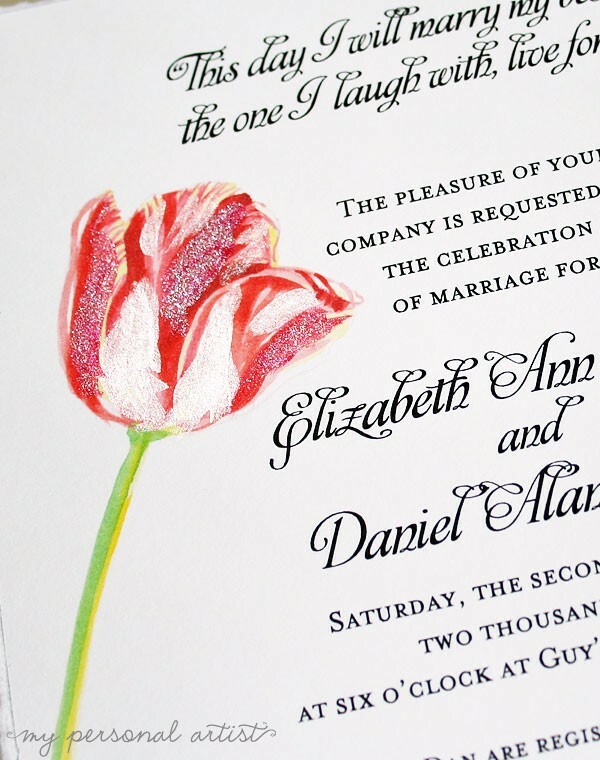 Here is a sneak peek of Elizabeth and Dan’s custom designed and hand-painted tulip wedding invitations. Per request of the groom-to-be he wanted me to actually hand-paint each tulip with metallic paint! LOVEEEEEE! The light bounces off the paint amazingly. I can not wait for my clients to see this in person. I have NEVER seen anything like it. So vibrant and detailed. I think it will knock their guests socks off. Recently food choices have become a must have on most reply cards here at My Personal Artist. If you are having a sit down dinner at your reception and need to know what food your guests are eating, response cards with a food choice helps distinguish your guests exact food choice. 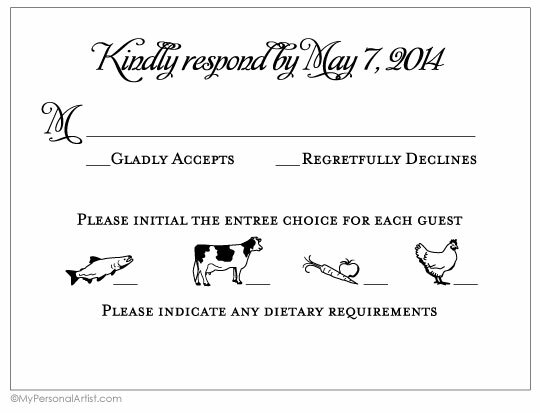 We now have these cute hand-drawn food choice motifs for your response cards. Just ask for us to add them when you place your order. No additional charges! Over the past 14 years I have had this question asked often… “What stationery pieces do I need for my wedding?” Of course the answer for everyone is different. Some just print up invites and have their rsvp on the invite. Some buy ALL pieces possible including fan programs. Read the descriptions below to help you decide what you TRULY need. The save the card announces you wil be married! Giving your guests a heads up is GREAT especially if you are having an out of town / destination wedding! You can mail these out 8-12 months in advance. View samples of our save the date cards. Sets the stage for your SPECTACULAR wedding day! This card INVITES your guests to your wedding! If your invite is truly unique, your guests may hang your invite on their frig for months. Our customers have bought the invitations with the vellum overlay and art on the 2nd layer card. We are told their guests take off the vellum and frame the card art! How fun! Be unique! REMEMBER, order ONE per household and NOT one per person. This will save you money. 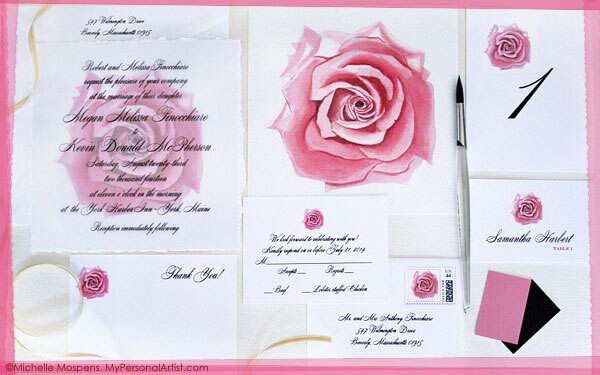 Order invitations 4 months before your wedding and mail them 2 months before your special day. View samples of our wedding invitations. Your guest will reply to you using this card! Normally the reply by date is 1 month before your big day. We found a reply by date at least 1 month before your wedding day allows you to prepare your last minute wedding stationery pieces with less stress. The small card can be used for a reception, direction card, registry card, or hotel and additional information you guests will need. Many times, people will list events and times for guests also. Remember, NEVER write “No gifts” on your invitation or small card. Your invite and other cards go in the inner envelope then the OUTER ENVELOPE. You address it to mail to your guests. We print your return addy on the back flap! These are normally nonlined. Your invite and other cards go in the INNER ENVELOPE then into your outer envelope. You write or have us print your guest names on this envelope. This helps your guests know WHO is invited. They say the inner envelope originated when the mail was delivered on horse back. To keep the invitation neat and free of mud and debris, the invitation was inserted into the inner envelope. The outer envelope kept the inner envelope clean and neat in appearance, as your guest opened their invite. The inner envelope is sometimes used for decorative purposes, by lining with beautiful colors. You can write the guests names on this envelope also. This allows you to invite exactly who you want to your wedding. For instance you write “The Miller Family” on the outer envelope front along with their address. Inside on the inner envelope you would write “John, Kathy and Liz”. This way they know their daughter Liz, age 15, is invited but their other 2 younger (ages 1 month to 3 years), children are not. if everyone is invites you would write everyone invited on the inner envelope. Unfortunately some people will bring the younger children invited or not. be prepared. Thank you cards rock! they are the BEST! They thank your guest! Try to mail these out ASAP! Guests get super sad when they receive their thank yous 2 months later! Before you marry … address your thank you card envelopes all you will have to do when you RECEIVE a gift is write the thoughtful thank you…throw in the envelope and mail that day! Announces your wedding day! A document that announces a special occasion has occurred or will occur. Contains a date and description. For wedding, it is said, you should not announce the time your wedding occurred. This card is often used to announce and invite guests to a reception at home after a destination wedding couple has already been married away from home then will return to parteeee! You should mail your announcements ON your wedding day. Shows your guests what you will be eating at the reception. Cools your guests and also doubles as a cool favor and/or program! Helps your guests follow your ceremony and introduces them to your wedding party. this also helps them understand some traditions you choose to incorporate in your ceremony. View samples of our wedding programs. My thinking for this design was to create an artwork the guests could treasure forever. They can frame this invite as a keepsake. The quality is amazing and truly sets the tone for any fabulous event! Imagine my bermuda moongate, romantic hibiscus, cruise ship, lakeside tree artworks and more on this style of card. 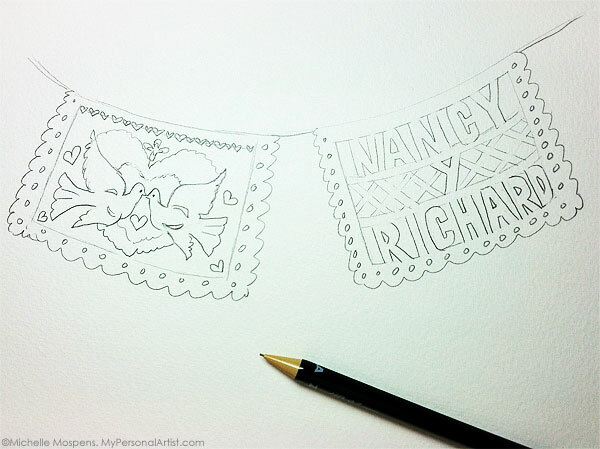 Friday night and I have just finished sketching personalized papel picados for Nancy and Richard’s custom wedding invitations! I will keep you posted on this one. Truly unique and fun! I just finished up Rachel and Shawn’s custom beach wedding invitations. The pocketfolder invitation style was the perfect choice for their destination wedding in Florida. 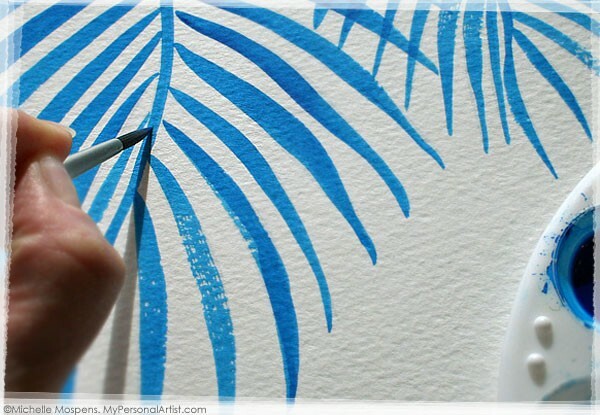 Adorned with beachy watercolors like seahorses, seaturtles, palm trees, and more! The folder is fitting sand metallic and the front tab and inside layer is buttercream lined in bronze metallic. They will marry under the palm trees I hand-painted for their information card. They both LOVE scuba diving and wanted to incorporate all they love on their wedding stationery. Whimsical yet still elegant! P.S. – Pardon the blurred areas on the photo. I respect my clients privacy and never feel comfortable giving away their private details online. Oh my goodness! I just want to take 5 minutes and sit on that bench in my painting. Ahhh … so relaxing! 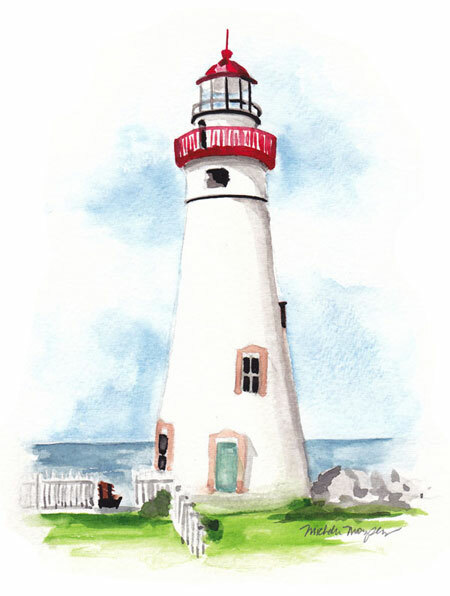 I hand-painted this Marblehead Lighthouse design for Kimberly’s custom bottle invitations. Aaadorable! She used the small size bottle and I can’t wait to hear what her guests have to say when they arrive. She will be married outside at Marblehead Lighthouse State Park in Ohio. Adding the venue scene to her invite was a must, truly personal and one-of-a-kind. I will add a photo of the bottle as soon as I meet the rest of my deadlines. 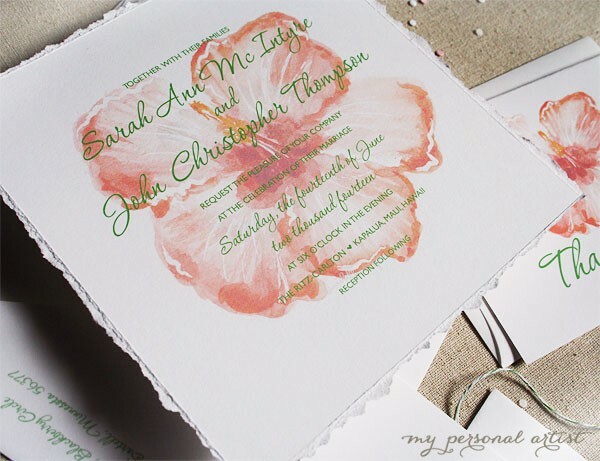 I am delighted to see such love for hand painted invitations AGAIN this year. Wowwwweeeee! It’s every where! 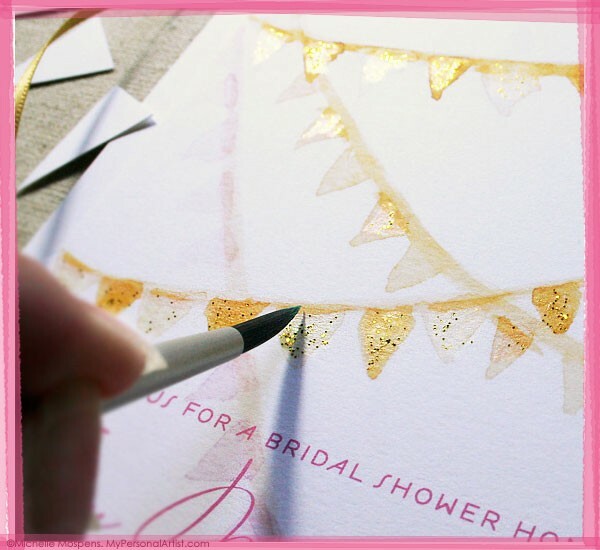 I was so excited about the hand-painted wedding invitations trend I started doing it… 14 years ago!!! What invitation artist wouldn’t be thrilled to jump on this hand painted designs band wagon though? I don’t blame them. Rich vibrant watercolor, sparkling paints, thick acrylic add ons, watercolor washes, and more! Think burlap, vintage lace, barns, banners, hanging outdoor lights, blue and clear mason jars full of long stemmed flowers, cardboard / kraft color cards with white ink, and more! 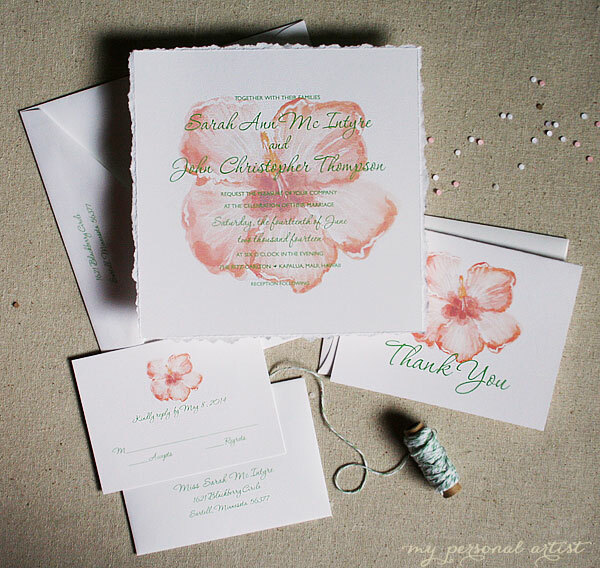 Rustic wedding invitations have a vintage twist that is ALL the rage in 2012-2013. Many of our 2012-2013 wedding couples are opting for more bold colors this year. Also, many are ordering more neutral tones such as khaki, champagne, white, and off white. There seems to be no in between when choosing invitation ink colors this year. It’s all or nothing. Teal and Purple seem to be rising to the top of the color choice chart. Bright Pink and Malibu Blue are also popular ink choices. Our chic clients want high quality invitations that have substance and texture. Letterpress and raised ink thermography printing have the luxe look and textrue many of our clients are looking for. Getting back to basics. More and more font designers are designing fonts that have a handwritten look and feel. The lines of a handwritten font are more jagged and less smooth. The handwritten calligraphy style fonts are popular choice among our clients. Fonts in invitation design are more casual then they were a decade ago. More couples want all lower case or all upper case text. It is still very popular to make the couples names stand out. 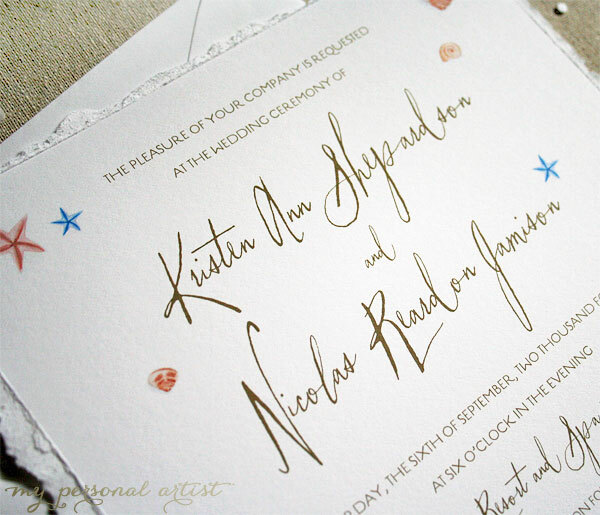 For instance the names may be 4pts larger than the invitation body text or in a totally different font all together. But more recently couples want their names as BIG as you can get them on the card. Why not? It’s their special day! 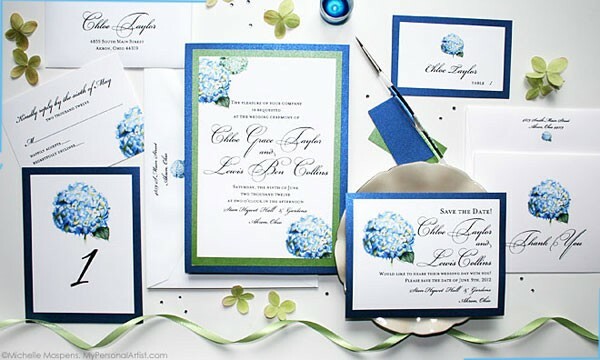 Designing invitations that reflect your personal style is gaining more popularity than ever! 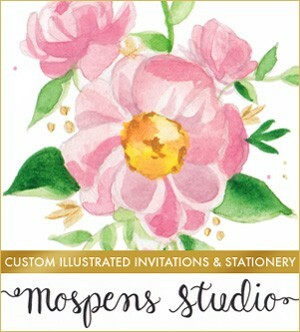 More and more couples are illustrating their hobbies, favorite vacation spots, where they met, where they had their first date, and more on their wedding stationery wardrobes. I recently did research for 2012 fashion trends and I am delighted to inform you that hand sketched flowers (not the already popular hand painted flowers) will make their debut in fashion! I’m talking about outline sketches. LOVE! 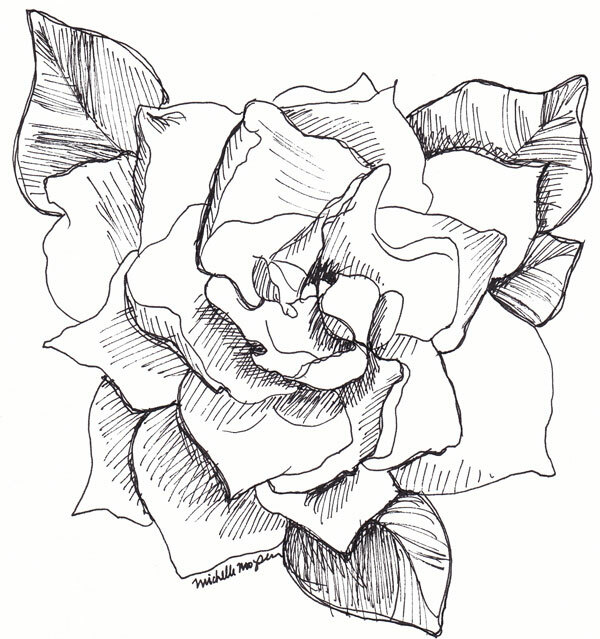 I have added even more sketched flowers to my already blossoming floral wedding invitations collection. I hand-illustrated an anemone flower, sunflower, rose, dahlia, and gardenia flower with loose hand-drawn sketched techniques. This style will not disappoint and I am sure will remain popular through 2012! I need to gather those examples together to show you! In the meantime following is my hand-sketched gardenia artwork I illustrated for my client Marissa’s custom wedding invitations and stationery. 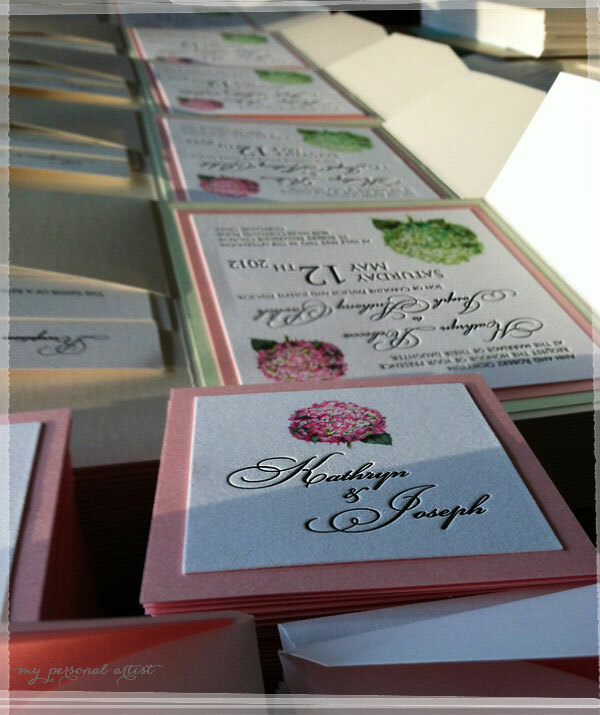 Our clients LOVE pocket folder wedding invitations. These handmade folders with gorgeous colorful layers are perfect for destination weddings. They hold ALL details and help your guests stay organized while planning their get-away to your wedding day! We are seeing many new and traditional motif choices this year. Monograms are hot! Peacock feathers, branches with flowers, daisy flowers, beach theme artwork, are still among the most popular choices for motifs. More rustic elegance and vintage themes are emerging. Vintage themes with lace, vintage postage stamps and romantic elegance are proving to be popular choices with our clients. Most of our clients strive to be unique and are always on the cutting edge in fashion and personalized style. No matter your style, express yourself and ENJOY! And as always HAVE FUN!!! What is your favorite wedding invitation design trend? Leave a comment! The search seems endless. You have looked high and low for wedding invitations different from your cousin’s and friends’ cookie cutter invitation styles that seem to be either cheaply “homemade” or over done to the extreme. You crave wedding invitations to fit your personality and style and feel like giving up. Well I’m here to tell you don’t fret. You are not alone. I’ve been working with wedding couples for over 14 years. Helping them create the perfect wedding invitation to fit their style. 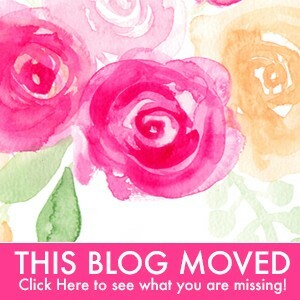 In this article I will outline idea categories to assist you in discovering your personality, style and the perfect theme or no theme for your invitations! As you read these categories ask yourself, is this ME? Do I LOVE this theme, color, motif, or idea? At the end of the article you will have a better understanding on what wedding invitations style will fit your personality best. 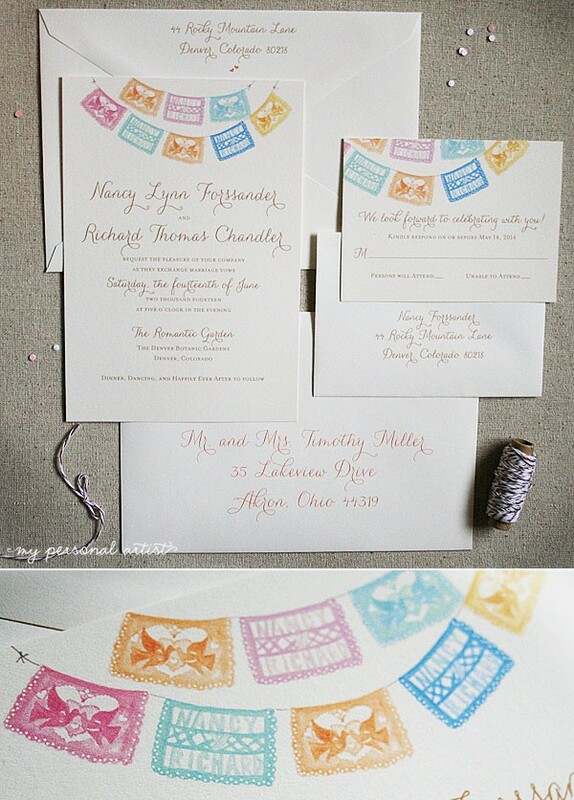 Choosing a color for your wedding and stationery is quite simple. What color or colors do you LOVE? Do you always wear red high heels? Do you love yellow? Maybe you love the beach and natural colors of sky blue and light sand brown? 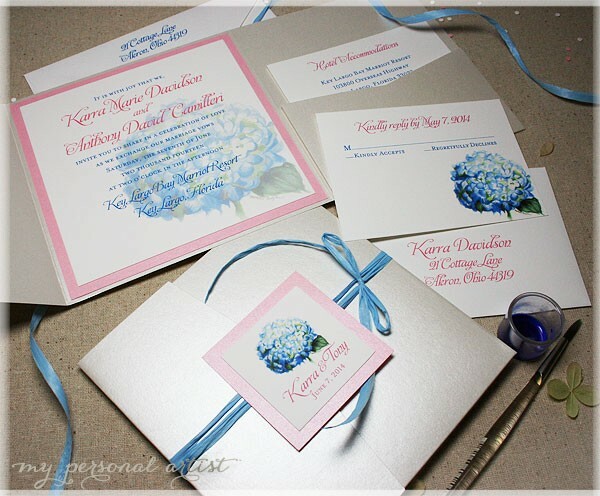 Incorporating your colors on your invitations can be done with ink, paper, ribbon, and or pocket folders. Or maybe you opt for an all white wedding look which is popular. Your text can be printed in silver or gray to keep the monochromatic look seamless and elegant. Choosing your invitation card style is easy! Are you a “less is more” type of person? Then an elegant simple white invitation card with a lovely black letterpressed font may be perfect for you. Love embellishments? A white card with a colorful background layer and a hand-tied ribbon around the middle will be the perfect fit for you. If you are a beach chic couple and your guests will only expect the very best, a beach themed invitation in a box is a great choice! Most of our clients strive to be unique and are always on the cutting edge in fashion and personalized style. Express yourself and ENJOY!! And have the most fun! Cheers! 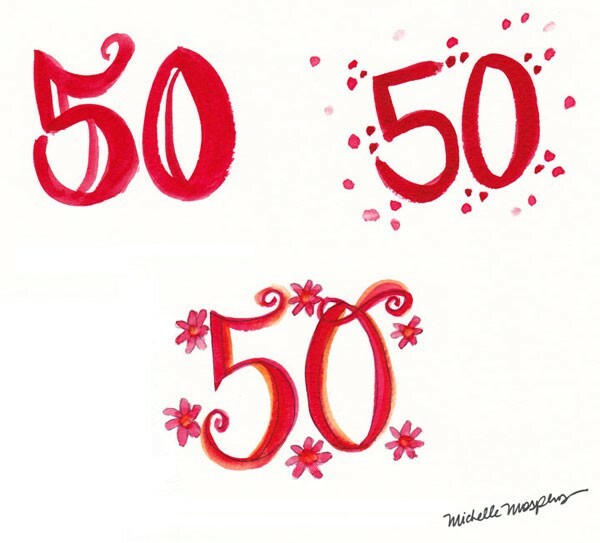 Hand-painted “50s” for Laquita’s custom birthday invitations design. Can you guess WHICH “50” she chose? Designed for her personalized bottle invitations adorned with hand-tied red wraphia and seashell necklaces. At My Personal Artist helping clients achieve an invite design that is TRULY unique to their style is so very delightful! 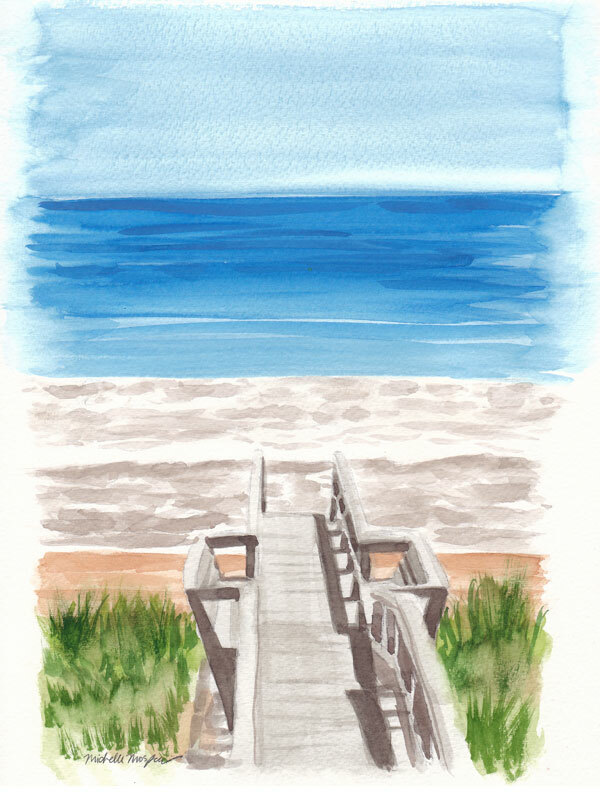 The Beach Boardwalk and Ocean hand-painted for Peggy & Brandon’s custom wedding invitation design. Can you hear the surf and feel the tropical breeze? One down and 10 to paintings to go today! Due to the high demand for my custom-made orders, the turn around time is now 3-4 weeks for brand new invitation designs with new artworks. Please plan ahead. If you find you are running behind, feel free to enjoy my Signature Collection wedding invitations. As always you can customize the card size, ink colors, fonts, and more! 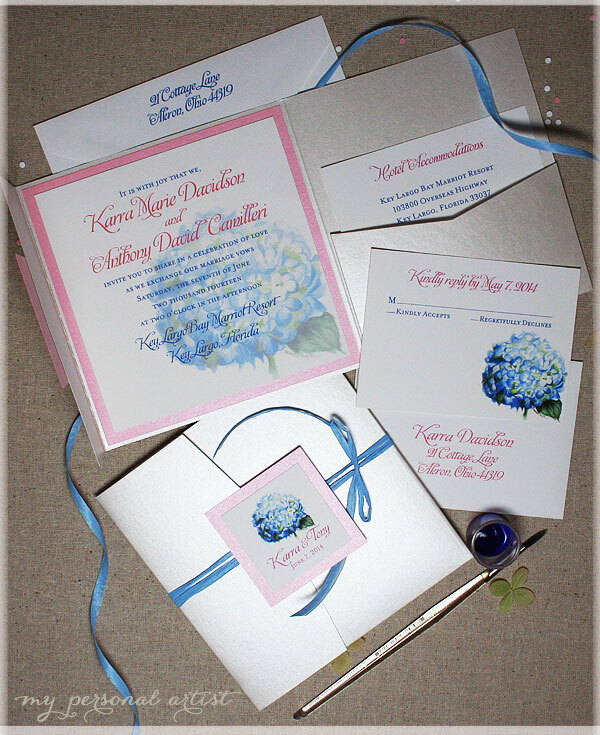 Make wedding stationery a breeze, follow our timeline for ordering wedding invitations. Good morning sunshine! I could not resist snapping a pic of Katie and Joe’s custom letterpress invitations this morning as the sun sparkled over their elegant pocket folder invitations. Simply gorgeooooooousssz! Handmade Invitation Ingredients: 900 card layers glued by hand, 150 hand-tied bows, 150 pocket-folders folded, 300 layers letterpress printed, 150 envelope liners cut by hand then inserted and glued, boasting watercolor hydrangeas in hot pink and lime green, card layers in rose metallic and pistachio. Next, those beautiful personalized small square cards/tabs will be glued to the front of each pocket folder. Meet KARRA! Our newest floral pocket folder wedding invitations design! Fresh, modern, with a vintage twist. 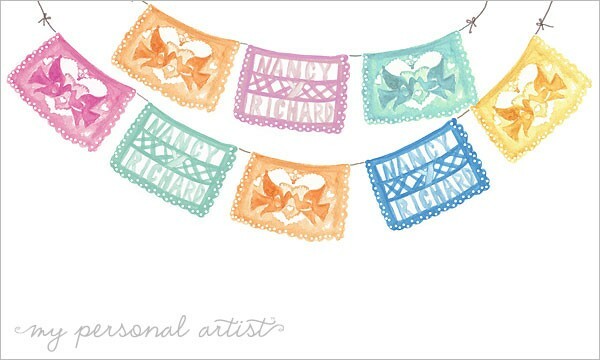 Ink colors, cardstock, ribbons, and fonts are all customizable as always at My Personal Artist! We are always adding new wedding invitations to our website. Made-from-scratch designs are welcome! Please plan ahead, we are booking up fast with summer and fall weddings. I am delighted to debut our newest custom wedding invitation with handmade watercolor seashells in soft beach chic hues with you. 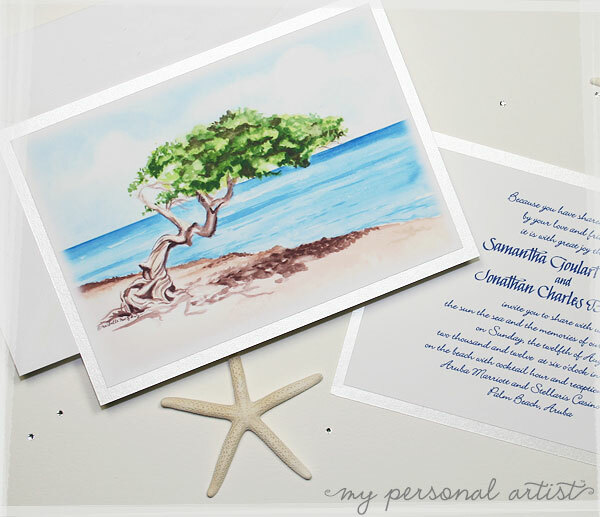 When our new customers tell me they found the most elegant beach wedding invitations at My Personal Artist and our designs are in their very own league, I know I’ve accomplished a great design task. 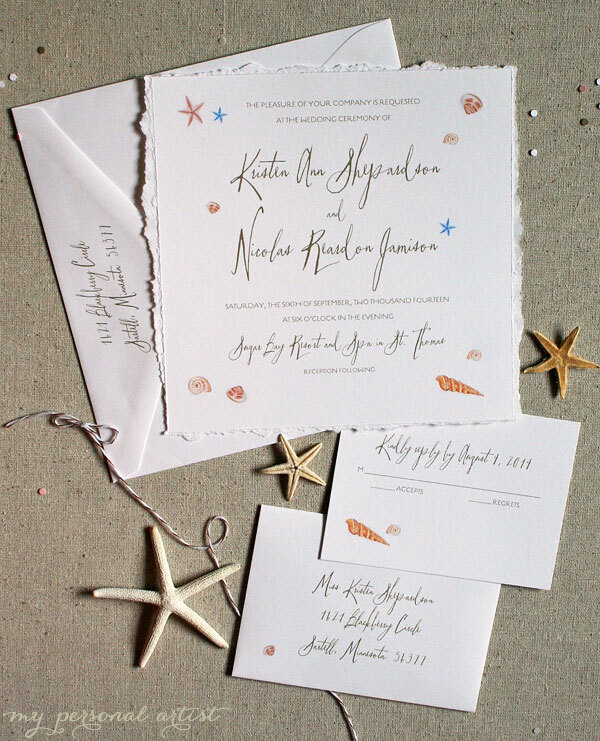 As we all know, not all beach wedding invitations are created equal. Stylish, modern and fresh beach theme designs have always been and will continue to be one of our specialties at My Personal Artist! So many more photos to be taken and uploaded. I can’t wait to share them with you. As always if you want a BRAND NEW custom design hand-crafted just for you, let us know we are always more than delighted. Soft tropical orange destination wedding invitations custom designed for a private client. Hand-torn thick 110lb cardstock boasting watercolor hibiscus artwork and lime green raised ink. Looks like a warm tropical Hawaiian breeze in person! The handmade edging really captures the Aloha Spirit!